Supreme Leader Snoke is a fictional character in the Star Wars franchise. He is a CGI character voiced and performed by Andy Serkis. Snoke was introduced in the 2015 film Star Wars: The Force Awakens as the Supreme Leader of the First Order, a military dictatorship resurrected from the fallen Galactic Empire, which seeks to reclaim control of the galaxy. Powerful with the Force, he seduces Ben Solo to the dark side; Solo serves him as the commander Kylo Ren. Snoke's appearance changed throughout principal photography and post-production of The Force Awakens. Serkis said, "It's the first time I've been on set not yet knowing what the character's gonna look like. I mean, talk about secrecy!" According to the actor, the character's appearance, voice, and movements evolved as he and the film's writer/director J. J. Abrams challenged the visual effects team. According to The Force Awakens senior sculptor Ivan Manzella, "Snoke almost became a female at one point. J. J. picked out a maquette he liked and then we took it to a full-size version, sculpted in plasteline. J. J. and [creature creative supervisor Neal Scanlan] didn't want him to be old and decrepit, like the Emperor." Andy Serkis portrays Snoke in the Star Wars sequel trilogy. While Serkis secretly joined the project in February 2014, his casting in The Force Awakens was first announced on April 29, 2014. When asked about his role in July 2014, he joked, "I'm not Yoda." In May 2015, a StarWars.com interview with photographer Annie Leibovitz about her The Force Awakens shoot for Vanity Fair revealed that Serkis would be playing a CGI character named Supreme Leader Snoke, and featured an image of the actor in motion capture gear. Serkis had previously played several CGI characters using motion capture technology, including Gollum in The Lord of the Rings film series (2001–2003), the titular ape in 2005's King Kong, and Caesar in the Planet of the Apes reboot series. When we first started working on it, [Abrams] had some rough notions of how Snoke was gonna look, but it really hadn't been fully-formed and it almost came out of discussion and performance ... We shot on set of course, and I was in the scenes I have with other actors, but the beauty of this process is you can go back and reiterate, keep informing and honing beats and moments. So J.J., after we shot last year, we've had a series of sessions where I'd be in London at The Imaginarium, my studio, while he’s been directing from L.A., and we've literally been creating further additions and iterations to the character. That's been fascinating. And in the meantime I've been able to see the look and design of the character grow and change as the performances change. So it's been really exciting in that respect. It was quite an unusual situation. I worked specifically with Domhnall Gleeson and with Adam Driver. My first day was basically standing on a 25-foot podium doing Lord Snoke without the faintest idea what he looked like ... or in fact who he was! I was very high up, totally on my own, away from everybody else, but acting with them ... we used sort of a "Kongolizer" method of having sound come out of speakers to give a sense of scale and distance for the character. So it was very challenging and scary, in fact probably one of my most scary film experiences I’ve ever had. Costume designer Michael Kaplan had the idea to give Snoke gold robes to contrast from his red and black throne room in The Last Jedi. Director Rian Johnson said the red motif was intended to evoke curtains in a nod to The Wizard of Oz, in which the titular character hides behind a curtain. The throne room was designed to look theatrical as opposed to Palpatine's, which was more utilitarian. The conceptual designers of the set were inspired by unused concept art for Return of the Jedi depicting Palpatine's lava-based lair under the surface of Coruscant. Snoke, whom Abrams called "a powerful figure on the Dark Side of the Force", is the leader of the evil First Order. He is master to the sequel trilogy's primary villain, Kylo Ren. Serkis described Snoke as "quite an enigmatic character, and strangely vulnerable at the same time as being quite powerful. Obviously he has a huge agenda. He has suffered a lot of damage." Serkis called Snoke "a new character in this universe", adding "I think it'd be fair to say that he is aware of the past to a great degree." Explaining why CGI was the only way to create Snoke's unique appearance, Serkis said before the film's premiere, "The scale of him, for instance, is one reason. He is large. He appears tall. And also just the facial design—you couldn't have gotten there with prosthetics ... he has a very distinctive, idiosyncratic bone and facial structure." Chief of creature and droid effects Neal Scanlan said, "This character is much better executed as a CGI character. That's just a practical reality when he's 7-foot-something tall; he's very, very thin." 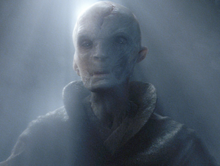 Snoke's "scarred, cavernous face" was not revealed before the release of the film, in which he appears as a "massive, ominous hologram". The character's deep voice was first heard in the teaser trailer released on November 28, 2014. Robbie Collin of The Telegraph described the disfigured and skeletal Snoke as a "sepulchral horror", Richard Roeper of the Chicago Sun-Times called him "hissing and grotesque", and Andrew O'Hehir of Salon dubbed the character "a spectral demonic figure". Variety's Justin Chang wrote that Snoke resembled "a plus-sized, more articulate Gollum", and Chris Nashawaty of Entertainment Weekly described him as "essentially Emperor Palpatine crossed with one of the aliens from Close Encounters." Stephanie Zacharek of Time called the character "a giant, scary, noseless dude who sits placidly in an oversized chair like a dark-lord version of the Lincoln Monument." There are multiple fan theories regarding the origins and identity of Snoke, including that he may be Darth Plagueis, a Sith Lord anecdotally mentioned in Revenge of the Sith and the master of Palpatine, possessing the power to prevent death; "the Operator" Gallius Rax, a mysterious First Order manipulator from Chuck Wendig's Aftermath novel trilogy; or Ezra Bridger, a main character from the animated series Star Wars Rebels. Pablo Hidalgo of the Lucasfilm Story Group dismissed the Darth Plagueis theory in May 2016, and Rax's death in the 2017 novel Aftermath: Empire's End disproved that theory as well. In his first appearance in the film, Snoke is introduced as Supreme Leader of the First Order, and master to Kylo Ren. Seduced to the dark side by Snoke, the masked Kylo is really Ben Solo, the son of Han Solo and Leia Organa. Snoke senses an "awakening" in the Force, and warns Ren that the limits of his power will be tested when he faces his father in pursuit of the wayward droid BB-8. Leia reveals to her estranged husband Han that it was Snoke's influence which corrupted their son. After Ren is defeated in a lightsaber duel with Rey, Snoke orders General Hux to collect Ren and ready him to complete his training. Following the events of The Force Awakens, Snoke reprimands Hux for his failings as a military leader, and Ren for his failure to find and kill Luke Skywalker. Ren brings Rey to Snoke, who tortures her for information on Luke's location. He reveals to Ren and Rey that he created the psychic bond between them as part of a plan to destroy Luke. Snoke then orders Ren to kill Rey, and gloats over his total control over his apprentice, only for Ren to use the Force to activate Luke's lightsaber, which Rey had been using, from a distance and slice Snoke in half with it, killing him. Snoke's Praetorian Guards attack both Ren and Rey in an attempt to avenge Snoke, but Rey and Ren briefly join forces to defeat the guards in a lightsaber duel. After Rey escapes, Ren declares himself the new Supreme Leader of the First Order, pinning Snoke's death on Rey to cover his actions. Snoke appears in the 2015 novelization of The Force Awakens by Alan Dean Foster. In the novel, Leia tells Han in more detail how Snoke, aware that their son would be "strong with the Force" and possess "equal potential for good or evil", had long watched Ben and manipulated events to draw him to the dark side. An unplayable Lego minifigure version of Snoke appears in cutscenes in the 2016 video game Lego Star Wars: The Force Awakens. In the spring of 2018, Snoke was added to the mobile MOBA Star Wars: Force Arena as a playable Dark Side squad leader. Todd McCarthy of The Hollywood Reporter wrote, "Supreme Leader Snoke is a larger-than-life, vaguely Harry Potter-ish hologram voiced with deep gravity by Andy Serkis; the full weight of this character's malignancy and dramatic power will presumably be better assessed in subsequent episodes." Richard Roeper of the Chicago Sun-Times called Serkis "the undisputed champion of the performance-capture roles". 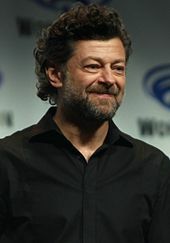 Though praising the "unobtrusive sophistication" of the visual effects used to portray the character, Variety's Justin Chang said that Serkis is "fine but not galvanizing" in the role. Lindsay Bahr of the Associated Press deemed Snoke one of the "less memorable" characters in The Force Awakens. In 2016, Serkis was nominated for an MTV Movie Award for Best Virtual Performance for the role. Some viewers felt that Snoke's character arc was underdeveloped. Various fan theories about his origins were held so strongly among some viewers that it was difficult for them to accept his demise in The Last Jedi. ^ a b c d e f Breznican, Anthony (November 12, 2015). "Supreme Leader Snoke: Andy Serkis on the 'damaged' villain of Star Wars: The Force Awakens". Entertainment Weekly. New York City: Meredith Corporation. Retrieved November 13, 2015. ^ Hawkes, Rebecca (January 5, 2016). "Star Wars: The Force Awakens: 12 things they cut from the film". The Telegraph. London, England: Telegraph Media Group. Retrieved April 12, 2017. ^ Serkis, Andy (December 15, 2015). "Andy Serkis' Supreme Leader Snoke Alternate Voices". TeamCoco (Interview). Interviewed by Conan O'Brien. TBS. Retrieved January 17, 2018. ^ Kit, Borys (April 30, 2014). "How Star Wars Director J.J. Abrams Kept the Cast Secret". The Hollywood Reporter. Los Angeles, California: Eldridge Industries. Retrieved January 23, 2016. ^ "Star Wars: Episode VII Cast Announced". StarWars.com. April 29, 2014. Retrieved December 20, 2015. ^ Hipes, Patrick (April 29, 2014). "Star Wars: Episode VII Cast Finalized: John Boyega, Daisy Ridley, Adam Driver, Oscar Isaac, Andy Serkis, Domhnall Gleeson & Max Von Sydow". Deadline Hollywood. Los Angeles, California: Penske Media Corporation. Retrieved January 23, 2016. ^ Karlin, Lily (July 11, 2014). "5 Things You Didn't Know About Andy Serkis, AKA Caesar From Dawn Of The Planet Of The Apes". The Huffington Post. new York City: Huffington Post Media Group. Retrieved January 23, 2016. ^ a b Guerrasio, Jason (October 11, 2017). "Andy Serkis reveals how he came up with the voice of Snoke for the Star Wars movies". Business Insider. New York City: Axel Springer III. Retrieved January 17, 2018. ^ Brooks, Dan (May 28, 2015). "Capturing a Galaxy: An Interview with Annie Leibovitz". StarWars.com. Retrieved January 23, 2017. ^ McLean, Craig (July 12, 2014). "The evolution of Andy Serkis". The Independent. London, England: Independent Print Ltd. Retrieved January 27, 2017. ^ Breznican, Anthony (November 12, 2015). "Star Wars: The Force Awakens: J.J. Abrams reveals backstory of alien Maz Kanata". Entertainment Weekly. New York City: Meredith Corporation. Retrieved January 14, 2016. ^ Thrower, Emma (November 17, 2015). "Supreme Leader Snoke: Andy Serkis talks Star Wars' latest villain". Empire. London, England: Bauer Media Group. Retrieved January 26, 2017. ^ Szostak, Phil. The Art of Star Wars: The Last Jedi. Abrams Books. pp. 92, 96. ISBN 9781419727054. ^ Dyer, James (August 25, 2015). "JJ Abrams Spills Details On Kylo Ren". Empire. London, England: Bauer Media Group. Retrieved August 25, 2015. ^ a b Zacharek, Stephanie (December 15, 2015). "Review: The Force Awakens Is Everything You Could Hope for in a Star Wars Movie—and Less". Time. New York City: Meredith Corporation. Retrieved December 16, 2015. ^ Tauber, Chris (December 5, 2015). "Who's the Real Bad Guy in Star Wars: The Force Awakens?". People. New York City: Meredith Corporation. Retrieved February 5, 2017. ^ Breznican, Anthony (January 2, 2016). "See exclusive new images of Maz Kanata and Supreme Leader Snoke from Star Wars: The Force Awakens". Entertainment Weekly. New York City: Meredith Corporation. Retrieved January 14, 2016. ^ Schuth, Louie (May 28, 2015). "Andy Serkis' Star Wars: The Force Awakens character revealed". Hypable.com. Retrieved January 27, 2017. ^ Lewis, Andy (December 1, 2014). "Trailer Report: Star Wars Teaser Beats Age of Ultron In Debut". The Hollywood Reporter. Los Angeles, California: Eldridge Industries. Retrieved January 25, 2017. ^ Collin, Robbie (December 18, 2015). "Star Wars: The Force Awakens review: 'the magic is back'". The Telegraph. London, England: Telegraph Media Group. Retrieved December 29, 2015. ^ a b Roeper, Richard (December 15, 2015). "Star Wars: The Force Awakens: The thrills are strong with this one". Chicago Sun-Times. Chicago, Illinois: Sun-Times Media Group. Archived from the original on December 18, 2015. Retrieved December 16, 2015. ^ O'Hehir, Andrew (December 16, 2015). "Star Wars: The Force Awakens: You know all the spoilers in J.J. Abrams' obsessive reboot — because you've seen this movie before". Salon. San Francisco, California: Salon Media Group. Retrieved January 15, 2016. ^ a b Chang, Justin (December 15, 2015). "J. J. Abrams' hugely anticipated blockbuster brings welcome jolts of energy, warmth and excitement back to the biggest franchise in movie history". Variety. New York City: Penske Media Group. Retrieved December 16, 2015. ^ Nashawaty, Chris (December 16, 2015). "Star Wars: The Force Awakens: A 'rollicking adventure wrapped in epic mythology'". Entertainment Weekly. New York City: Meredith Corporation. Retrieved January 19, 2016. ^ Trumbore, Dave (December 21, 2015). "Star Wars: The Force Awakens: Theories on Supreme Leader Snoke". Collider. Retrieved January 15, 2016. ^ Tremeer, Eleanor (December 28, 2015). "Supreme Leader Snoke's Role In Star Wars Episode 8 Revealed By John Williams?!". Moviepilot. Archived from the original on February 2, 2017. Retrieved January 27, 2017. ^ Maharana, Kabita (December 29, 2015). "Star Wars 8: Fan theories about Rey's origin and Supreme Leader Snoke's identity". International Business Times. New York City: Newsweek Media Group. Retrieved January 27, 2017. ^ Tremeer, Eleanor (August 29, 2016). "Supreme Leader Snoke Origins Revealed In Star Wars 7 Book Aftermath?". Moviepilot. Archived from the original on 2017-02-06. Retrieved January 23, 2017. ^ Myrick, Robert (January 22, 2016). "Why It Makes Sense For Star Wars Rebels' Ezra Bridger To Be Supreme Leader Snoke". Moviepilot. Retrieved February 20, 2017. ^ "Even More Evidence That Ezra From Star Wars: Rebels Is Supreme Leader Snoke". Moviepilot. July 18, 2016. Retrieved February 20, 2017. ^ Williams, Claire. "TheoryLoop: Is Ezra Bridger really Supreme Leader Snoke?". Looper. Retrieved February 20, 2017. ^ Siegel, Lucas (May 10, 2016). "Star Wars Story Group Definitively Says Supreme Leader Snoke is Not Darth Plagueis". Comicbook.com. Retrieved March 1, 2017. ^ Gardner, Kate (March 7, 2017). "What the Aftermath Trilogy Tells About Star Wars: The Last Jedi". Screen Rant. Retrieved March 14, 2017. ^ Breznican, Anthony (November 12, 2015). "Supreme Leader Snoke: Andy Serkis on the 'damaged' villain of Star Wars: The Force Awakens". Entertainment Weekly. New York City: Meredith Corporation. Retrieved January 17, 2018. ^ Bibbiani, William (December 21, 2017). "Star Wars: The Last Jedi director explains Snoke's big scene". IGN. San Francisco, California: J2 Global. Retrieved January 17, 2018. ^ Harrison, George (December 19, 2017). "Who is Supreme Leader Snoke, does he die in Star Wars The Last Jedi, is Kylo Ren his apprentice and is he Darth Plagueis?". The Sun. London, England: News UK. Retrieved January 17, 2018. ^ Foster, Alan Dean (2015). "Chapter X". The Force Awakens (e-book). New York City: Del Ray Books. ISBN 978-1-101-96550-4. ^ Foster, Alan Dean (2015). "Chapter XIV". Star Wars: The Force Awakens (e-book). New York City: Del Ray Books. ISBN 978-1-101-96550-4. ^ Tylwallk, Nick (16 March 2018). "Old Luke, All-Out War Mode Invade 'Star Wars: Force Arena' in New Update". TouchArcade. Retrieved 11 April 2018. ^ McCarthy, Todd (December 16, 2015). "Star Wars: The Force Awakens: Review". The Hollywood Reporter. Los Angeles, California: Eldridge Industries. Retrieved December 29, 2015. ^ Bahr, Lindsey (December 16, 2015). "Review: Star Wars: The Force Awakens Is Fun Fan Service". Tribune-Star. Terre Haute, Indiana: Community Newspaper Holdings. Associated Press. Retrieved February 6, 2017. ^ Lovett, Jamie (March 8, 2016). "Deadpool, Avengers, And Star Wars Nominated For MTV Movie Awards". Comicbook.com. Retrieved February 6, 2017. ^ Collura, Scott (December 15, 2017). "Why Do Some Star Wars Fans Hate The Last Jedi?". IGN. Retrieved December 21, 2017. ^ VanDerWerff, Todd (December 19, 2017). "The 'backlash' against Star Wars: The Last Jedi, explained". Vox. ^ Goodmand, Stephanie (December 18, 2017). "The Last Jedi and You: What Fans Think of the Newest Chapter". The New York Times. Retrieved December 21, 2017.